This photo was taken on November 28, 2016 at 8:07 AM. The location was on one of the streets that pass through the National Mall in Washington DC. The "Take It!" 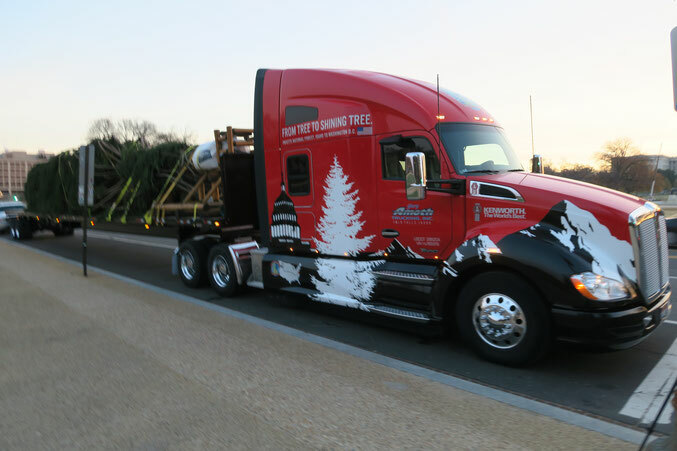 was yet again a very lucky occurrence in that it was the second time in a number of years that I just happened upon a truck which was the transporter for the National Christmas Tree. This one had come all the way from Idaho. 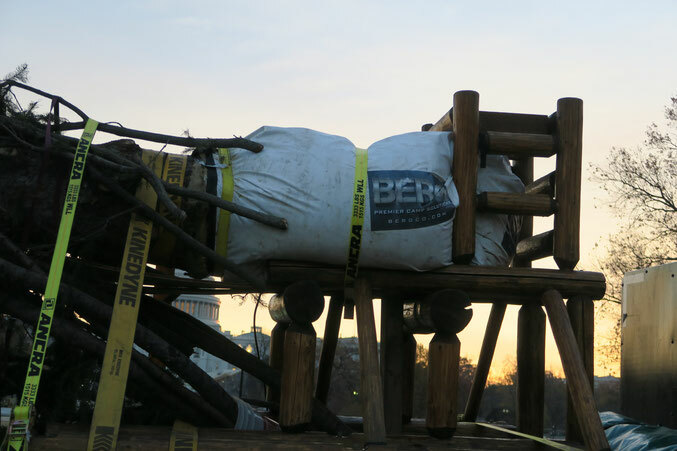 I immediately stopped my car and spoke with the crew of Forest Rangers that had accompanied the tree on its journey to Washington to serve in this ever so important role. They had harvested the tree from a site overlooking a lake in Northern Idaho. They left Idaho on November the third and had made their way accross this country at a relatively leisurely pace. In short order a Forest Ranger in the detail had essentially become my guide. He explained that the tree was set up and held in place on the trailer, on hand made scaffolds which were from my amature woodworking view, quite magnificent on their own. The bottom of the tree trunk was encased in a bladder that held approximately eighty gallons of water which the tree drank up about fifteen gallons per day keeping itself fresh during the journey. 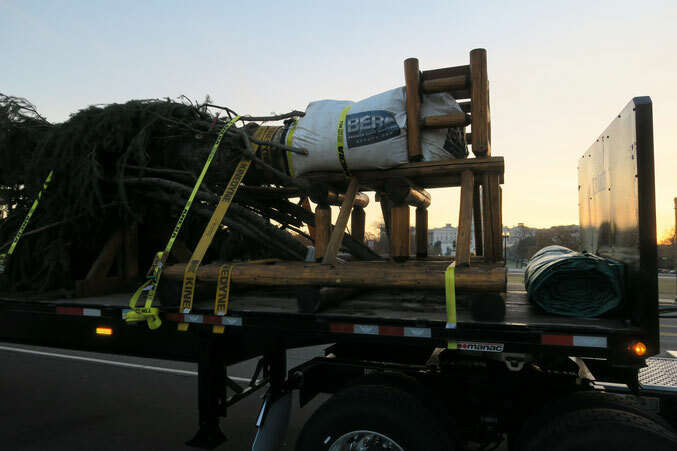 The larger bottom branches had been cut off and carefully packed next to the tree as the span of them could not be compressed to fit on the trailer without actually breaking them. The branches were also taken very good care of, and would be reattached to the tree when it had been stood upright in its display location ready for the President and First Lady to lead the ceremony of the lighting of the tree. The Forest Ranger that was my guide, asked me If I would like a sprig from a branch from the tree as some had fallen onto the bed of the trailer. I with gratitude said yes, and was brought one piece of about 6 inches. Seeing my delight in the gift, he then asked if I would like a small pine cone. Of course, I said yes, and was quickly provided with a small cone, again from the floor of the trailer, under the tree. I felt just like a kid. It was simply great. Along with my thanks, I gave him and the others in the crew, business cards from Whutzzat.com. The Ranger told me the trip was as of that point, the trip of a lifetime. I could easily see the total enjoyment all of them were sharing with the other people, like myself, that they were easily and readily engaging with. He said their entire trip had included stops along the way, to share the experience with the public. I know this may sound corny, but it was almost as if they were glowing with the joy of the experience. And, of course, there was way more to come. The After Take: Has been just great, as I have shown people this set of photos while they are still in my camera on the card. I tell of the gallons the tree drinks every day while making the journey and they, like me, are amazed. I also spoke of the friendliness of the escorting Forest Rangers and how they thought of the trip as the one of a lifetime. From the looks on listeners faces, all could understand this, and I think some even had a look of how they would have liked to have been along for the experience. I consider myself to now be a messenger in this life. It is the engaging and sharing of an experience like this, that has me happy and humble in my assignment. As these Holidays progress, I am in hopes all of us are always ready and share the civility we have available, at an instants notice. All my very best to each of you. PS: Not knowing how long the needles would stay on the very small branch, I took it, along with the tiny pine cone, and placed it on the hood of my car. By doing this I was able to take advantage of the white color for a background, and took the attached photo. Nice story! How about a followup photo when it's up and decorated? Oh boy, I can't stand decorating my 5 ft tree. This would be my worst nightmare. Merry Christmas everyone! From our house to yours, we hope you all have a wonderful holiday.